Consumer Contact: Challenger Supply Holdings at (800) 729-6118 between 7 a.m. and 6 p.m. CT Monday through Friday or online at www.challengersupply.com and click on “Product Recall” for more information. Description: This recall involves all models of single- and dual-purpose Coaire and Quietside brand tankless gas water heaters. The recalled water heaters heat either 4 or 7.2 gallons of water per minute. They are white and come in the following dimension ranges: 25-28 inches tall x 15-19 inches wide x 8-14 inches thick. 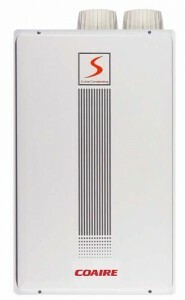 The words “S-Line Condensing” are on the top front and brand names “Coaire” or “Quietside” are on the bottom front of the recalled water heaters. Previous: My toilet is running due to high water pressure – what do I do? Next: I moved my toilet’s location during a remodel (or a new floor install) and now it leaks at the base?